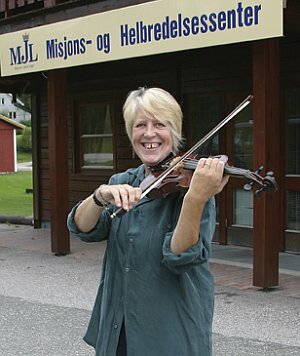 Playing again: After six years with the arm injury Margaret Beresford can now play violin agian. She had to quit her music career after she broke an arm on the dance floor in a restaurant in Kristiansand, Norway, in October 1998. But all hope was not gone for the wellknown music-professor. July 22, 2004 became an important day for Margaret Beresford from England, who now lives at Hægeland in Norway. Some dates one never forgets – one`s own birthday, children`s birthdays, wedding anniversary etc, or the day a loved one died. I have three rather special ones I would like to share with you. The first of these is October 14th 1998 – a day which started happily in the company of many friends and colleagues in the Church, and ended in tragedy when I broke my arm. Already I can feel your interest fading! Breaking an arm is not a tragedy compared with, say, the terrible injuries sustained in a car crash, or a terminal illness - and I quite agree. One of my earliest memories is of creeping downstairs to sit on the bottom step just before Christmas each year. My father would be on the stepladder in the lounge, putting up the paper chains, and my mother decorating the tree, the house redolent with the smells of Christmas baking, and the music of Handel`s “Messiah” filling the air.It was always on the radio just before Christmas, and I always got sent up to bed long before the – in my view – “best bit”, ie. the “Hallelujah Chorus”. Hence the creeping downstairs! My cousin Brian Hunt – well known to many of you readers! – taught me to play the descant recorder when I was 10, and then in my 2nd year at Grammar School, aged 12, I was fortunate enough to be given a violin by our next door neighbour. it was love at 1st sight! Just to open the case, and to see that beautiful instrument nestled in the blue velvet, tinged with the faintly evocative smell of resin, was enough. I learnt in a group the 1st year, under the auspicies of the local Music School, and then progressed to individual tuition. At 14 I persuaded my parents to buy a piano, and began lessons with Yvonne Enoch who was a wonderful inspiration to me right up until she died a few years ago. By the age of 16 I had passed Grade V111 violin, and Grade V1 piano, and knew without a shadow of doubt which direction my life was taking. Just before my 17th birthday I was awarded a place at the Guildhall School of Music & Drama, London, to study both piano and violin as joint 1st studies – quite unusual! I left school the day I received the letter of acceptance – my Headmistress was NOT pleased, she had me all lined up for Oxbridge to read English. I had 7 wonderful years at the Guildhall, 4 as a fulltime student, and then continuing part-time for 3 years. I had brilliant teachers, Eli Goren on the violin, Paul Hamburger for piano accompaniment, and Yfrah Neaman, who was my mentor in all things musical. My career was wonderful and exciting. My first real job was teaching the choir boys at St. Paul`s Cathedral Choir School, then I became Head of Strings for the whole of Surrey County (aged 24! ),also teaching violin at Surrey University. At the same time I ran Holiday Courses for my pupils,involving intensive study – I did all the teaching AND the cooking!- and started my own Chamber Orchestra, the Surrey Strads. I was also doing a lot of accompanying in recitals all over Britain, and I played at the opening of the St. David`s Hall in Cardiff by the Queen Mother, on the same bill as Petula Clarke! I then took a 5 year break from teaching in schools and played the violin professionally as 1st violin in the London Concert Orchestra and others. Then a job as violin teacher at the famous Lady Eleanor Holles School, Hampton, tempted, and the Surrey Strads was renamed the Holles Strads! The post of Director of Practical Music was created especially for me, and enabled me to develop the Chamber Music in the school to the highest level. When I was 15 I learnt to play the organ – having lessons in Canterbury Cathedral!- and was playing for Services in Canterbury Congreational Church by the age of 16. In 1986, following the birth of my 2nd son ( our 1st was born in 1984, the year we got married) the whole family moved to Norway. We had had friends here since the `60s, and had long envied the space and freedom this beautiful country offers, and decided this was where we wanted to raise our family. The musical culture and traditions are very different here, there were not the opportunities for playing so much, but a new path opened and I was soon working in various Music Schools as well as being appointed organist in the Norwegian State Church in 2 neighbouring Churches. I should perhaps mention here that all church activities in Norway are strictly non-alcoholic!- and we were all dancing a polka when the heel of my shoe caught in a loose bit of the dance floor and I fell, breaking my left wrist. I remember the crack as my arm broke, my horror at seeing the angle of my wrist. Amazingly I immediately thought to remove my watch and rings, so they wouldn`t have to be cut off. I remember the pain. The break was a complicated Colles fracture, and I was operated on that night, screws were put into my hand and arm , a so-called Hoffman`s screw. From the start the whole thing was a nightmare. I was in agony most of the time,I got an infection and was given penicillin despite being allergic to it. It all got so bad that the screws were removed – without any form of anaesthetic!- after 3 weeks and a normal plaster put on. But the 1st one was too tight and my poor hand got black and swollen, so it had to be cut off and another applied. When after about 6 weeks the plaster was removed, one could see at once that my hand was very crooked and not at all as it should be, and I was still in a lot of pain.I had got reflex dystrophy, and had very little use in my left arm. There followed a nightmare year, a blur of pain both mental and physical. I visited 2 different Specialists in GB., and was 2 times up to the State Hospital in Oslo – all to no avail, they wouldn`t operate again because of the reflex dystrophy. I went to the Pain Clinic, and seemed to spend hours each week going on the bus to physiotherapy. Later my husband fixed a tractor - handle to the steering wheel of our old automatic car, so that I could drive one-handed. At this stage the mental anguish was even worse. I couldn`t play anything at all on either piano or violin, and just to hear music was enough to have me in floods of tears. I sold my piano, I couldn`t bear to see it, and hid my violin. In the January following the accident I started teaching again, piano & violin pupils – this with just one hand that functioned! My pupils loyally said they would rather have me one-handed than anyone else. All this time I was of course aware that many family and friends in both England and Norway were praying for a miracle, but nothing seemed to be happening. So comes the 2nd date I wish to share with you. 11th November 1999. I was teaching piano in one of the Music schools, demonstrating something with my right hand, my useless left hand just lying dead on the keys, When suddenly the little girl I was teaching shouted out “ Maggie, Maggie, your hand is moving!” I hadn`t even noticed! The pupil promptly burst into tears, and I just stared in wonder. Albeit stiffly, I could play the piano again! There were many joyous phone calls that night, sharing the good news with all those who had been praying for me, and the next day I went back to the Church office to report for work – they had been just about to advertise my job as organist, it being over a year since the accident! Although I had regained a lot of movement in my hand, there were still a lot of things I couldn`t do - there was no lateral movement in the wrist,I had very limited stretch between my thumb and 1st finger (8ves were a thing of the past), and I couldn`t swivel my wrist at all. So the violin was a complete impossibility. But I practised the piano and organ for hours, having to teach myself an entirely new way of playing. There were still painful areas I found difficult to explore. For example, I had nothing like the dexterity I had had before, and I had to learn many new ways to do things. I still couldn`t bear to listen to violin music, or any of the orchestral or chamber pieces which I had previously played.. In our small village of 210 houses there is, amazingly, a registered healer! He is called Svein Magne Pederson, and has been an Evangelist for more than 30 years, and has also been blessed with the gift of healing. Typically, “a prophet is not known in his own country”, and he has had very little recognition here. I had never met him, but it so happened that on the 3rd of the dates I promised to share with you, 22nd July 2004, I visited him in desperation over a completely different matter.We talked for some time, I also had a friend with me (moral support! ), and on the way out his wife said to me “Aren`t you the organist who had all the trouble with her arm? I have prayed so hard that you would come to us for help!” Svein Magne knew nothing of the case. I had become to accept this terrible thing as a part of my life, and in a way almost forgotten it even though it burnt a hole in me to even think of the violin. As soon as Svein Magne understood the problem, he took hold of me, of my left hand, and started to pray to Jesus to heal me. I`m so glad I had a friend with me, or no-one would believe what happened next! Whilst Svein Magne held my wrist, my fingers began to move – faster and with more dexterity than they had in 5 years – more and more – they were playing 1000 violin concertos – my thumb was unlocked and really pliant... For about 10 minutes (so my friend said afterwards, I had no concept of time) I “played” all the concertos I had ever learnt. Svein Magne said he had never seen anything like it;certainly I had no control over what I was doing. Eventually it all slowed down, eased off. I was both exhausted and exultant, Svein Magne the same. We prayed together, and thanked Jesus. I can now play the violin again! Of course, after 6 years, not exactly beautifully, but it`s coming. Already I can play together with my pupils, and I should like to take a bit of a refresher course so that perhaps I could play professionally again for a short while before I retire. Thanks to God, and a wonderful healer here in Norway called Svein Magne Pederson, I am now a whole person again. That inner part of me, my musical soul, which I had lost so dramatically in 1998, had been restored. Miracle: One simple prayer for healing and the six years of suffering was a thing of the past.